Pizza Man in Minnesota and Wisconsin makes pizza with fresh ingredients everyday! there are now over 30 PIZZA MAN locations. We owe our success to our fresh quality ingedients, our special recipe sauce and our dough which is made daily from scratch. 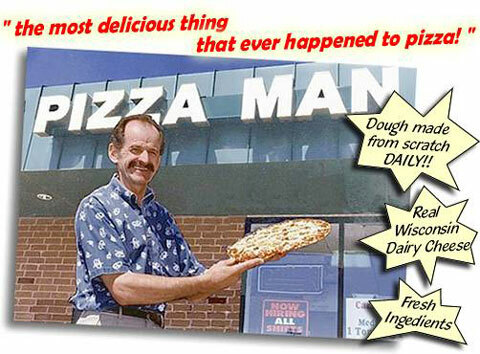 If you like sausage, you'll love our sausage prepared the old fashion way, just for PIZZA MAN PIZZA. Our Pizza's are not pre-made. Each PIZZA MAN PIZZA is individually prepared with our fresh quality ingredients and topped with Real Wisconsin Dairy Cheese. Then slow baked the old fashioned way. It takes time to properly prepare a quality product and we wouldn't want it any other way! So please . . . call ahead and we'll have your order ready when you come to pick-up your PIZZA! Or, have it delivered . . . HOT! Either way . . . ENJOY!! !